Technically, the Avanti 2 and Avanti Boost are different shoes. I’ve worn both. The new Avanti Boost FEELS like a 3K spike to me. It’s aggressive enough to roll a mile in, soft enough to run a 5K for (which is what I used it for), but the 3K just feels like it would be such a sweet spot for it. I’ve seen guys run the 800m in it, but I’d probably give the nod to the Adidas Ambition, or the MD, if that’s your primary event and looking to stick with Adidas. With a surprise visit to our track session today by the Euro Nike Rep, it was like Christmas in June to be able to tr all the new spike releases. The new Vic3 is suuuuuch a nice ride. You guys are going to love it. The Elite feels aggressive in a nice way, but would be far too much past 800m for me. It feels very much like the lanang in terms of foot fall (I don’t know if that translates well). The new Matumbo is a massive step ahead of the matumbo 2. It has much more spring to it, yet maintains a nice feel to the feet. Can you confirm they are perma pins? I should add the obvious disclaimer that Nike could always change this technical plate fact, as well as the release date (verified as October 1 both in Europe and globally), effectively portraying me as the court jester. Of course, that would not be much of a stretch! Ja, and I was also told that the white/black would be released to the public as a color option. All good information, but as I stated, can always change as can be the case with Nike. How are the brooks wire 3/4? I’m thinking of snagging a pair for xc next year (unless I use my streak lt 2s). Why only track spikes or flats? 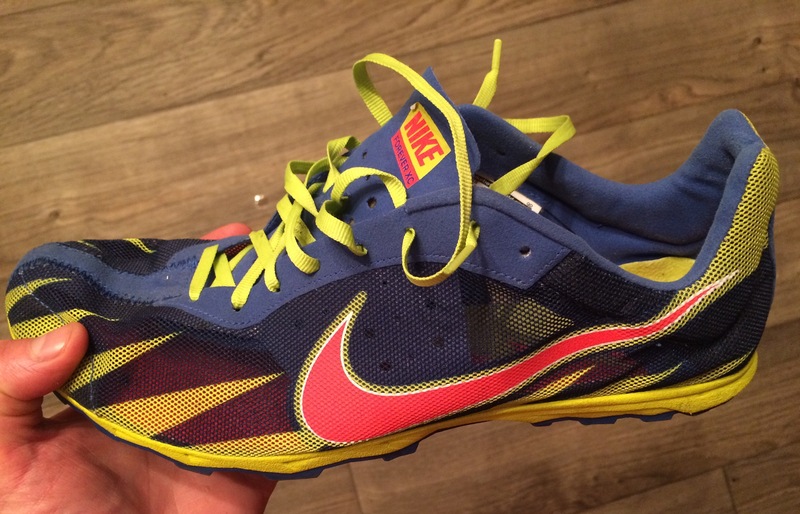 Why not a pair of xc spikes? I’ve never been a fan of xc spikes… I’ve always preferred the feel of my lt 2s and adios over my vic xcs/carreras/mach but don’t want to use my track vics (which I love the feel of) for cross. Plus the wires are cheap on brooks’ website and they look to have a somewhat durable outsole (although that is probably because of the dark paint used on certain parts). just put on Eldorets for the first time. the upper is awesome. it’s the most comfortable upper I’ve ever felt on bare feet. feels like it might get a little hot but I can’t really tell. shoutout to @greatestgee for the hook-up! 1)If these are the 2’s (I don’t remember), and 2)you race without socks, AND 3)you value the skin on the tops of your toes, then 4)run as far away from them as possible. Those are the 3’s. Exactly the same as the 2’s except the 2’s have a regular tongue while the 3’s tongue is padded. what do you guys think of adidas Takumi-Sen for cross country training/racing? mostly on the track of a grass field for workouts, mostly on grass and gravel for racing. I think the flat would probably be awesome on the road for sure, but I’m skeptical about how the Boost foam would feel on softer surfaces. does it just turn to mush on grass or soft tracks? also, sizing? size 8 in Nike flats/spikes translates to what for adidas? Takumis are a good road flat, I prefer them for racing as opposed to training because of the price point. The Boost holds its integrity for quite a long time, but the Takumi has such a small insert its different than that of their other trainers/flats. I’ve found their the same size for me as wearing a Nike Streak. Anyone here use the Adidas Ambitions for XC? I saw a few Michigan and Wisconsin guys use them and was curious as to how they would hold up. Same plate as the OG avantis which held up great, so I can’t imagine the ambitions would be any different.